To all the New Yorkers who went to Yom Kippur services instead of checking out the city’s hottest new show: G’mar Hatima Tova, and don’t miss next week. 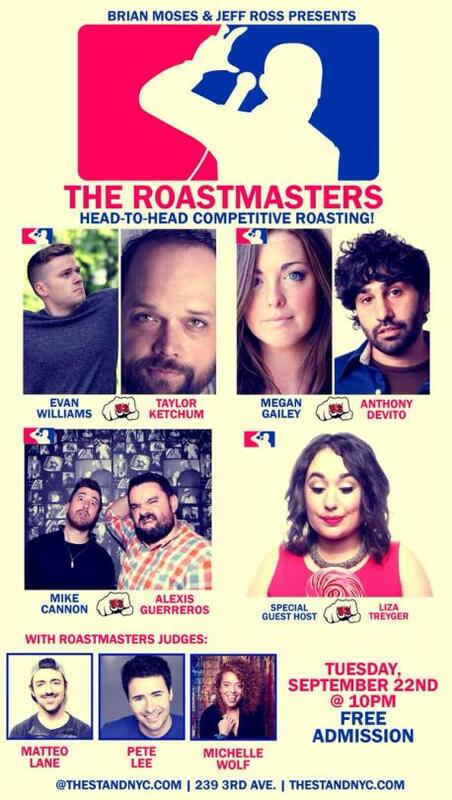 If you’re not on board with competitive roasting yet, you’re a schmuck, plain and simple. This week’s doozy of a bout was as entertaining as ever, with guest host and experienced battler Liza Treyger subbing in for the traveling Luis J. Gomez. Liza proved herself to be a formidable host, amicable and supportive with the right amount of acidity. She was slinging more heat than the spicy margaritas she encouraged everyone to drink, and even if a joke didn’t land, she didn’t let it faze her, steamrolling on with a pro’s confidence. She introduces the first two judges, both battlers from previous weeks: Matteo Lane and Pete Lee. When she asks them if they have any advice, they both offer up the same tidbit: don’t be gay. (Don’t worry, NYC battlers. If the LA show’s track record is any indication, the LGBT community will prevail in the ring soon.) After checking in with our former losers, Liza introduces the final judge: Michelle Wolf, rising stand-up and writer on Late Night with Seth Myers. The first bout of the night: Joe Namath jersey wearer Anthony DeVito versus Chicago transplant Megan Gailey. Whereas the past few weeks have seen the first battles devolve into lackluster bouts where the judges wish death upon the competitors and themselves, this week helped prove an essential battle tactic that Sean Donnelly showcased last week: if you’re likable, you can get away with a lot more. Compared to the poised Megan, Anthony looked and acted like he’d just woken up from a nap to find himself in front of a packed crowd. Yet his infectious smile and genuine nervousness to insult Megan, a comic who he admittedly likes and respects and thinks is very pretty, keeps the crowd from turning on him. Round one begins with what would become a signature of Anthony’s: saying Megan’s name strangely. By the end of the round, Megan is acting more like an embarassed big sister than an opponent, trying to keep Anthony’s boyish energy in check so he can stay focused. The judges elect Anthony the winner of round one in a clean sweep. The round ends as Liza wonders aloud if going to the judges is even necessary due to Anthony’s forfeit. Megan wins round three in a clean sweep, and the crowd goes wild. The judging tables turn as Matteo and Michelle both vote for Alexis to win the round. Pete, on the other hand, votes for Mike because Alexis still has a wife. Someone messed with the wrong divorcé. Mike peters out near the end of the round while Alexis surges to victory, winning the bout in a clean sweep. The stage is cleared once more to prep for the main event: Evan Williams versus Taylor Ketchum. Then an audience member falls in the front row. The suspense hangs in the air for a minute before Michelle closes out the round by naming Evan the champion. Liza raises his hand high. Cameras flash, the DJ plays some fanfare, and the Roastmasters have risen to the occasion once more. We’ll see you next week, folks. L’chaim!